I’m so pumped. 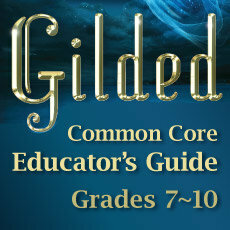 My publisher, Skyscape, is celebrating the release of GILDED’s new 22-page novel guide by giving away a limited number of class sets of GILDED. Isn’t that amazing? I almost fell out of my chair when my publicist emailed me. It’s so excited to be a part of a publisher who is committed to education. It’s super easy to be a part of this. Click on this link or fill out the form below to apply! (use the scroll bar to move down the form) If you aren’t a teacher, but you have teacher friends, please share this with them. Good luck and may the force be with you. Absolutely! I’m so excited that they are doing this. Just applied! Thank you so much!!! Just forwarded this link to all my teacher friends! One of my favorite books so far this year!